Born in Beijing, China, Yadong Guan started studying Pipa at the age of seven. She completed her university training at the Central National Conservatory in Beijing as a musician with Master Lin Shi Cheng, an artist and renowned teacher in China. She was awarded the first prize of National Art Student Contest in 1996. Since then, she has been selected many times to participate in cultural exchanges and distinguished herself in various contests as a Pipa virtuoso as well as a composer. As a ministerial prize recipient, honoured by the United Nation's World Women's Conference, Yadong has participated in several China National Television broadcasts and been invited to host and give Pipa lessons in a video series that is distributed in Taiwan and Hong Kong. Elected Miss Capital by the Women Association of Beijing, this Pipa artist has devoted a record to the traditional repertoire of her instrument. 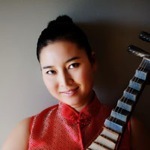 In Canada since 1997, Yadong completed her Masters degree in composition at the Faculté de musique de l'Université Laval and continues to explore the Occidental repertoire that could be played by her instrument. She established the first string band in Quebec that works in an East meet West style. The group, comprised of local musicians, successfully merged Pipa and its music with western musical instruments and repertoire. The band is highly praised by audiences and the media. Local radio stations and Radio Canada have interviewed her and broadcast her music many times. She has also spoken at many conferences and workshops on the topic of music history and culture in past and present China. 1992 - Invited to host an educational video series of Pipa instruction, which was distributed in Taiwan and Hong Kong.